I Needed to Win. They Needed to Die. Sallot Leon is a thief, and a good one at that. But gender fluid Sal wants nothing more than to escape the drudgery of life as a highway robber and get closer to the upper-class―and the nobles who destroyed their home. When Sal steals a flyer for an audition to become a member of The Left Hand―the Queen's personal assassins, named after the rings she wears―Sal jumps at the chance to infiltrate the court and get revenge. But the audition is a fight to the death filled with clever circus acrobats, lethal apothecaries, and vicious ex-soldiers. A childhood as a common criminal hardly prepared Sal for the trials. And as Sal succeeds in the competition, and wins the heart of Elise, an intriguing scribe at court, they start to dream of a new life and a different future, but one that Sal can have only if they survive. MASK OF SHADOWS by Linsey Miller features Sal Leon, a genderfluid thief who wants nothing more than to exact revenge on the Lords of Erlend—those who ensured the annihilation of Sal’s country of birth, Nacea—and left them as its only survivor. The book starts with a robbery that introduces Sal, and as a result of that robbery, Sal learns of a competition to determine the newest member of the queen’s Left Hand—four bodyguards/assassins who are charged with protecting the queen and removing anyone who is a threat to her or Igna, the country created from the war that destroyed Nacea. Sal decides to enter the competition, and that adventure continues the book’s initial break-neck pace. Upon entering the competition to be Opal of the Queen’s Left Hand, Sal becomes known as Twenty-Three—their number/name having been assigned based on the order the competitors were accepted into the competition. Sal is accepted based on fighting skills and a willingness to kill, and though Sal shows signs of being kind and caring at times, they are also ruthless. All of the competitors are ruthless, but beyond that we only know them by their numbers and the skills that will make them able killers. The early competition scenes were my favorite parts of the book. 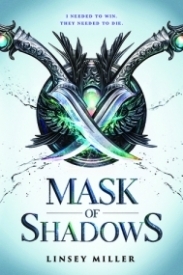 The fight-to-the-death premise of MASK OF SHADOWS is one that is found in many fantasy or historical fiction novels, but the execution of this book is interesting for many reasons. Sal’s genderfluidity is mentioned at times, and an attempt at explaining genderfluidity is woven into Sal’s initial interview with the three members of the Left Hand running the competition, but it’s not the reason for this novel, just an aspect of it. MASK OF SHADOWS has many (many many) strong female characters, but gender plays such an insignificant role in every character that the world built by Miller seems somewhat utopian when it comes to equality and the understanding that the sexes are equal. Women are just as likely as men to fill any roll, and it’s not remarked upon at all. Gender roles are definitely not a thing, and the lack of them is not a thing either. A flaw in the tale is that Sal is the only characters who is fully developed by Miller--and that’s a shame because there’s such potential in so many others. In particular, Emerald, Amethyst, and Ruby—the three remaining members of the Left Hand—are people readers want to know more about, and I hope the second book expands on their stories. The lack of character definition also made it difficult to keep track of many of the secondary characters as they stepped in and out of scenes. The love story woven into the book is sweet, but not all that interesting. That’s not something that bothers me—I don’t read adventure novels with an eye toward a good romance. The action scenes are really well written and they are constant, and the competition aspect of the book is well plotted. There are moments of far too much explaining as the book winds to a close, but that’s understandable as the author sets the stage for book two. The world building is strong except for the aspects surrounding magic and its removal from the world, and although the conflict that lead to the creation of Igna is repeatedly mentioned, more history on that would have been helfpul. Again, that could be something that will be developed more in the second book. All in all, I recommend the book to those who like sword and sorcery books—though all sorcery takes place in the past—and a lot of action. I’ll be looking forward to the second book and revisiting Sal’s world. My thanks to NetGalley and the publisher for a copy of the book in exchange for my honest review. I really enjoyed Mask of Shadows. I'm pretty sure this is the first book I've read with a gender fluid character and I felt that it really added to the story. Sal watched everyone he/she knew die and has wanted revenge ever since. Sal decides to try out to be Opal, a member of the queen's "The Left Hand". They are the queen's assassins and the other Opal died while on an assignment. Sal was living life as a thief up until then, not able to read or write, but very skilled. While on their last heist, Sal meets a lady whom they feel something different for. Sal even let her keep a piece of jewelry. Sal found the paper about the Left Hand auditions, kills someone for the entry, and leaves. While trying out for The Left Hand, Sal is competing against 22 others. Sal is 23 (fitting since it's my favorite number). The audition includes learning different skills, both physical and mental. I really liked the poison lessons. Sal goes in for a lesson to learn how to read and write and finds Elise, the same girl he stole from. They flirt and she remembered who Sal was right away. "I was Sallot Leon-one of the last children of Nacea, orphan and street fighter, highway thiefand Twenty Three." I loved Sal, but I really found myself loving Maud, the maid. She was funny and a great side character. Elise was bold and smart, always a good combo. I also really enjoyed the rest of The Left Hand. I won't ruin anything for anyone who hasn't read this yet. Sal competes. There is a lot of death, some backstabbing, a little romance, and revenge. I gave this book 4 stars. It was a little confusing with all the names and places, but the story was fast paced with a lot of action.